I recently discovered Savannah Bee Company Tupelo honey, which was on my "wish list" until my lovely niece, Jessica, gave it to me as a gift. I was initially smitten with the beautiful bottle and packaging design, which I'm always a sucker for. Once I tasted it, I was hooked! 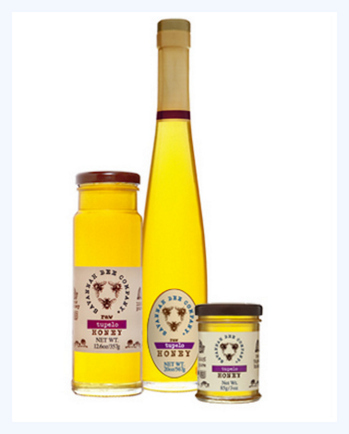 Tupelo honey is a rare honey that is harvested during a two week time period in the Spring. It has a buttery, sweet flavor that melts on the tongue and it will never crystallize, which is a bonus! I love drizzling honey on cinnamon raisin English muffins topped with ricotta cheese and sprinkled with cinnamon. Delicious! 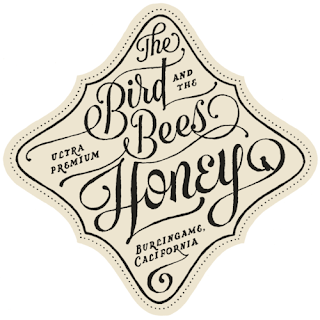 Since we're on the topic of honey, I can't help but post an image of another favorite honey label ... love the typography!